When I was in fourth grade my mother and aunt took me and my cousin to see the movie Out of Africa. It’s not exactly a children’s movie which made me feel a little grown up at the time. Since then it has remained one of my favorite movies–ever. It’s ironic to note that my husband has never actually watched it, even though I’ve seen most of his John Wayne movies. But I digress. Out of Africa a story about love, loss, and the determination of a woman, Karen Blixen, to make a life for herself in colonial Nairobi in the earlier part of the 1900’s. And even though at ten I was not the intended audience, it left a deep impression on me. Maybe it was the picturesque landscapes that first drew me in—lions, a woman with a gun on a safari, white linen clothing, etc. Though later on it was definitely the story about the storyteller Isak Dinesen that spoke to my heart and has been with me ever since. For several years a copy of Out of Africa has been present on my writing desk for mere encouragement. In 1914 Karen Blixen, who wrote under the pseudonym Isak Dinesen, moved to Kenya to marry her second cousin Bror. There, she and her new husband purchased a house and land just outside the city where they had hoped to have a thriving coffee plantation. She was in her late twenties when she moved there and spent almost two decades in Africa until a series of tragic events occurred and forced her to return to Denmark. Her memoir, Out of Africa, on which the movie is based, is about her life in Kenya minus most of the messy relationship parts on which she is doesn’t give many details—biographers did that later on. 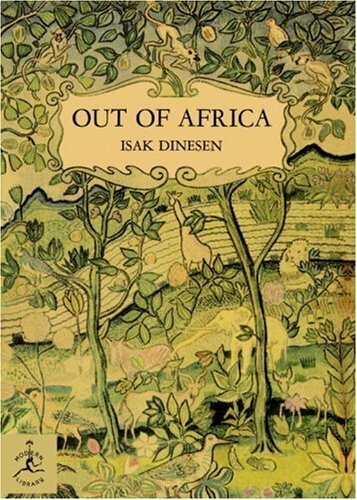 Over the years, particularly when I was in college, I did quite a bit of research on Dinesen’s life and work. I love characters in general—both real and literary—and she was certainly fascinating and enigmatic in life and on paper. There’s something about her story that inspires me– her strength as she lived in a country very different than her native land of Denmark; her determination to find happiness, but often experiencing loss and sometimes physical pain; and finally the way she seemed to take life’s joys and disappointments and use them to craft her stories, which is what resonates so much with me now. So whether it’s Isak Dinesen or Karen Blixen, she has been an inspiration in my life in ways I can’t aptly express in a blog post. If you are interested in further reading she has several collections of beautiful and sometimes haunting stories along with more stories from her experiences in Africa.